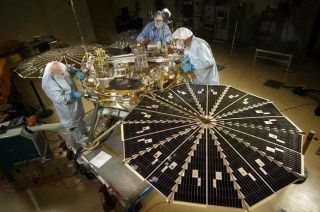 NASA'sMars-bound Phoenix lander completed its first and biggest course correctionplanned during the spacecraft's journey. The secondof the remaining five planned adjustments prior to landing is scheduled formid-October. "Thesefirst two together take out the bias intentionally put in at launch," saidBrian Portock, Phoenix navigation team chief at NASA's Jet PropulsionLaboratory. Phoenix blastedoff Earth aboard a Delta 2 rocket on Aug. 4 and now careens through spaceat 74,200 mph (33,180 meters per second)?a speed necessary to cover the 422millions miles (679 million kilometers) between Earth and Mars by May 25, 2008. Following adifficult landing in the northernicy reaches of the red planet, Phoenix will unfurl a digging robotic arm totest the icy Martian soil for habitable conditions for microbial life. So far,mission managers said, all is well. "Allthe subsystems are functioning as expected with few deviations from predictedperformance," said Joe Guinn, Phoenix mission system manager at JPL. Over thenext month, the $420 million spacecraft's support team will check itsscientific instruments, radar and the communication system needed duringand after the soil-sampler's landing. When it does land, Phoenix principalinvestigator Peter Smith said it will be a milestone in space exploration. "We'llbe discovering the truth about the icy regions on Mars," Smith said duringa briefing shortly after Phoenix's early morning launch.